Elevators are used constantly every day. Most people would be surprised at the number of trips an elevator can log in a given day, month, or year. In many cases, it is comparable to driving your car 100,000 or more miles per year. With this amount of usage, elevators absolutely need to be maintained: They have mechanical and electrical systems just like your car. It is very important to schedule periodic elevator maintenance, and Nationwide Lifts should be your go-to source for elevator maintenance services. Regular maintenance is necessary to ensure the safe operation of any type of elevator. Unfortunately, some elevator maintenance companies use technicians with minimal training. At Nationwide Lifts, our knowledgeable maintenance technicians are experts at performing routine maintenance tasks as well as detecting any potential problems with an elevator. Often, addressing a potential problem during a maintenance check can help a customer avoid costly repairs in the future. In addition, we use the latest tools and equipment to provide our customers with the highest quality maintenance work. Also, our courteous technicians are respectful of your property: We accomplish our work in a timely way and clean up the area so you can get back to your normal routine as soon as possible. Another reason to call our elevator maintenance company is that we provide service for both residential and commercial elevators. Our technicians have experience with glass home elevators, outside elevators, and limited-use elevators along with other lifting devices. In short, you don’t have to spend time calling around to different elevator maintenance companies to find the right professional to evaluate your elevator. 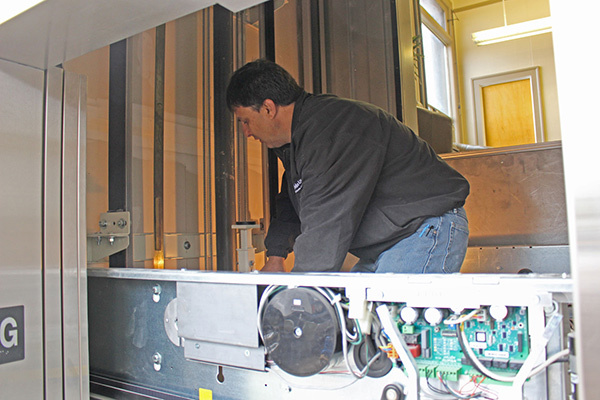 Our knowledgeable technicians have the skills to keep all of your elevators in great working condition. Our elevator maintenance company makes it easy for you to arrange for the service you need. You can contact us by phone for a quote or reach us online by clicking “get a quote” for more information. We make every effort to schedule an appointment at the most convenient time for you. We also can send you a free catalog if you’d like to purchase a new elevator for your business or home. It offers specific details about the most reliable elevators and lifts available today.